We continue our search for the true history and current whereabouts of the square tail single fin with tiger spray that featured in the classic 1981 Australian coming of age/surf movie Puberty Blues directed by Bruce Beresford. Starring Nell Schofield. 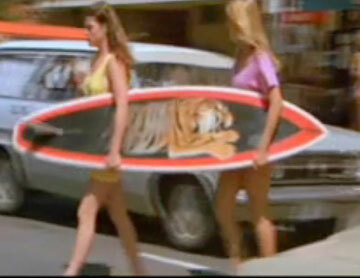 I present to you an ad from Emerald surfboards Cronulla featuring a strikingly similar Tiger spray board. Closer inspection will reveal that the board in the ad is a rounded pin tail twin fin and is missing the bold red keyline around the tail. 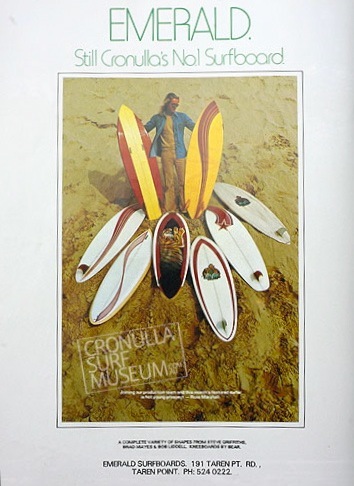 with thanks to Andrew, Steve Core & Cronulla surf museum's Chris Stroh. How good were the logos then! Expression was the name of the game, not conservative minimalism! White boards lack character and smack of flocks of sheep! Bring back gob-fulls of colour, crazy logos and flair!